Bath & Body Works: Buy A $10 Tote Get 40% Off Anything You Can Fit Inside! You are here: Home / Expired / Bath & Body Works: Buy A $10 Tote Get 40% Off Anything You Can Fit Inside! This is a great deal! 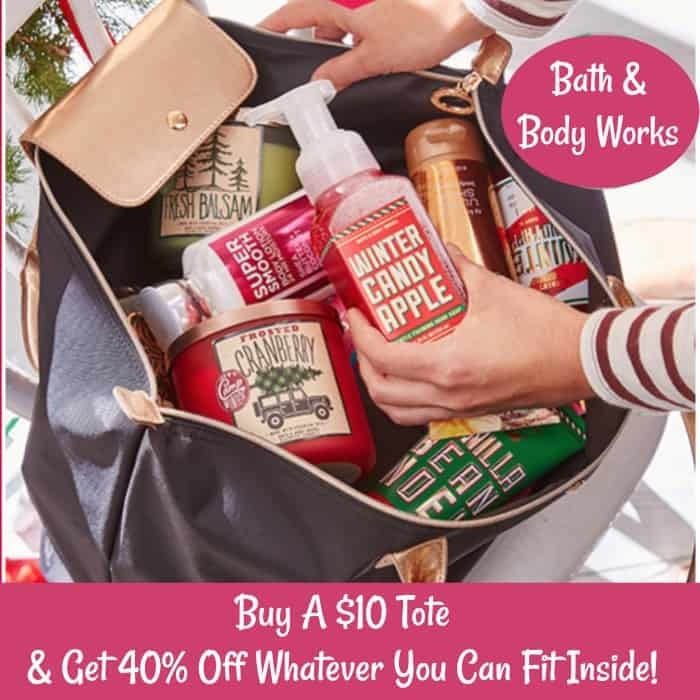 TODAY ONLY 12/16/18 Bath & Body Works is has a deal where when you buy a tote for just $10 and you’ll receive 40% off EVERYTHING you can fit inside! Valid in-store only! Note: Discount applies to retail prices, does not apply to clearance items, or gift cards. Again, this offer is valid in-store only BUT, for those who can’t make it to the store they do have a Buy Three, Get Two FREE offer on select body care items and 50% off Wexler products!